A-HOTEL.com - Luxury and cheap accommodation in Castiglioncello, Italy. 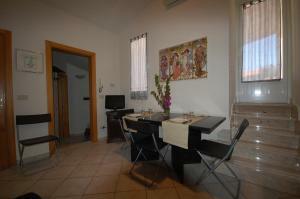 Prices and hotel, apartment booking in Castiglioncello and surrounding. This indicative offer was derived from the most recently booked accommodation in Castiglioncello and sort by the price, from cheapest Castiglioncello accommodation to the most expensive hotels. To select accommodation by your preferences we recommend to choose from 67 accommodation offers in Castiglioncello in total. By entering the dates of your overnight stay in Castiglioncello and using the filter tools you can sort the best possible accommodation for you. The entered dates of your stay are crucial for the most accurate offer as it derives all the online information on pricing and availability of Castiglioncello accommodation. Then you can book the selected Castiglioncello lodging (hotels, apartments etc.) immediately. Located in Castiglioncello, Caletta Apartments provides accommodation with air conditioning and access to a garden. Complimentary WiFi is provided. Located just a 5-minute walk from Castiglioncello's sandy beach, Villaggio Mietta offers air-conditioned apartments immersed in a garden with swimming pool. Each unit has a small garden and free WiFi. Situated in Castiglioncello in the Tuscany region, Casa Giuditta features a terrace and sea views. This apartment features a private beach area. Hotel Atlantico is a family hotel offering well equipped, comfortable accommodation only 200 metres from the sea and comprehensive amenities including 2 swimming pools and whirlpools. Hotel Atlantico enjoys a strategic location, immersed in a lush green area in the centre of Castiglioncello. Featuring a terrace, Spianate provides accommodation in Castiglioncello with free WiFi and sea views. The property features accommodation with a balcony. La Piazzetta is situated in Castiglioncello. Guests staying at this apartment have access to a fully equipped kitchen and a terrace. Boasting accommodation with a terrace, Il Quercetano is set in Castiglioncello. The accommodation is 44 km from Pisa. With barbecue facilities, Casa Fosca is a self-catering accommodation located in Castiglioncello, 60 metres from the beach. Free WiFi access is available throughout. The 3-star Albergo Miramare offers a seafront location in the town of Castiglioncello, only 400 metres from the train station. It features sea views from both its furnished terrace and its wine bar. Set on the promontory of Castiglioncello, 60 metres from the beach and seafront promenade, Hotel Tirreno dates back to the 19th century and has an elegant Art-Nouveau design. All air-conditioned, rooms at the Tirreno also feature free Wi-Fi, a minibar and a flat-screen TV with satellite and pay-per-view channels. Located in Castiglioncello, Albergo Pensione Bartoli offers a garden, shared lounge and bar. Each accommodation at the 1-star hotel has sea views and free WiFi. Residenza Luce is located in Castiglioncello. Guests may enjoy free WiFi. Set in Castiglioncello in the Tuscany Region, 35 km from Pisa, Casale I Macchiaioli features a seasonal outdoor pool and barbecue. Lucca is 49 km away. Featuring free Wi-Fi access throughout and a shared terrace, Villa L’Assolata offers rooms on the beachfront in Castiglioncello. Castiglioncello Train Station is a 15-minute walk from the property. Hotel Costa Verde is set just a 5-minute walk from Castiglioncello Train Station, and it offers air-conditioned rooms. Set in its garden, it features a traditional restaurant, free lobby WiFi and free private parking. Featuring an outdoor pool and a sun terrace, Casale del Mare offers modern accommodation surrounded by vineyards and olive groves. Located in the Tuscan countryside, the property produces olive oil, wine and grapes. Set in Castiglioncello in the Tuscany region, Appartamento Castiglioncello nel Casale features a patio. Featuring sea and mountain views, this apartment also provides guests with free WiFi. With its secluded cliff-top location 750 metres from the centre of Castiglioncello, Hotel Baia Del Sorriso features panoramic views of Quercetano Bay. It offers free parking and a Tuscan restaurant. Set in the pine wood of Castiglioncello, also known as the Pearl of the Tyrrenian Sea, Hotel Leopoldo is a classic Tuscan villa built in the early 20th century. The rooms offer free Wi-Fi, a flat-screen TV, and a minibar.